Tupapa Maraerenga dominated on the pitch in ball possession and created several goal scoring opportunities during the match but were unable to get pass the determined Takuvaine defence. Takuvaine also had several attempts at goal but could not find the back of the net. Despite a showcase of footballing prowess from star strikers on both sides, neither could get a goal in forcing the match to a penalty shootout to determine the winner. 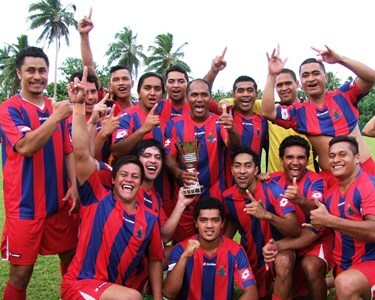 The men from the Valley scored three of their five attempts while Tupapa Maraerenga scored only two of their attempts. In the Senior Women’s knockout final Nikao Sokattak defeated Tupapa Maraerenga by two goals to nil with goals coming from Tekura Kaukura and Tepaeru Toka in the second half of the match. In the under 17 men’s division Puaikura defeated Avatiu three goals to one with goals from James Strickland and Dwayne Tiputoa for Puaikura and Dylan Areai of Avatiu. In the Under 14 boy’s division Tupapa Maraerenga beat Puaikura one goal to nil. In the Under 14 girl’s division Tupapa Maraerenga proved their dominance in their match against Puaikura, defeating them by five goals to nil. In the popular under 11 mixed category Tupapa Maraerenga taking out the title honours for 2014 beating Puaikura in a penalty shootout five goals to four. The matches lived up to its excitement and thrills right from the start to the final whistle at the CIFA complex in Matavera. On behalf of the Cook Islands Football Association we would like to wish everyone a Merry Christmas and Happy New Year.